Shop Doctor Who - Page 118 of 125 - The Place to shop for Doctor Who gadgets. Why get only one pair of Doctor Who socks when you can have two. This is a pack of 2 pairs of men’s crew socks. 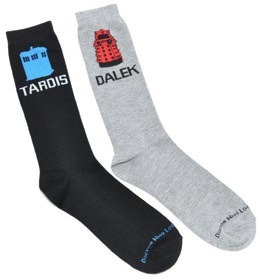 One pair is black with the blue Tardis on it and the other pair is grey with a red Dalek on it. You have to keep these pairs of socks separated because other wise they fight. These socks make a fun gift for a man that loves the Doctor as much as you do. We all know the Doctor needs his Sonic Screwdriver and should never leave anywhere without it. This Doctor Who t-shirt will help him remember. On the t-shirt you can see a Sonic Screwdriver in active mode and around it it says “Sonic Screwdriver Don’t Leave Home Without IT”. 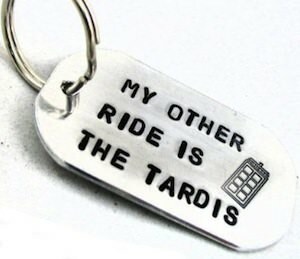 And this makes it the perfect way to remind the Doctor to take his screwdriver. This Sonic Screwdriver t-shirt is colored ice grey and the print is is Tardis blue. 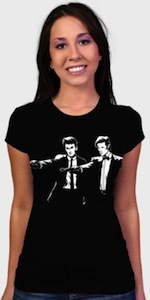 And this Doctor Who t-shirt comes in sizes Small to 3X-Large. 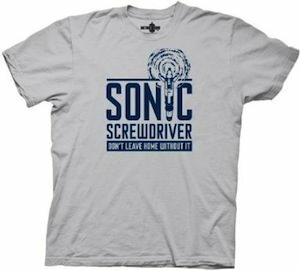 Add a t-shirt to your Doctor Who collection so come and checkout this Doctor Who Sonic Screwdriver Don’t Leave Home Without It T-Shirt. Are you worried that someone will steal your spot on the beach? 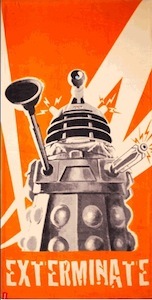 If so then you need to bring some fire power and what better way to do so then with a Dalek towel. This orange towel shows a Dalek in attack mode and below it it says “Exterminate” just like we are used to hear from the Dalek’s. If you are a Doctor Who fan in need of a towel then this could be a great addition to your collection of towels. The Doctor Who towel is made from 100% cotton for optimum softness and absorption. The Doctor would be nowhere without his trusted Tardis so if you want to be the Doctor’s next companion then maybe you should dress like you are the Tardis. This fun sleeve less Tardis dress will make you be the perfect companion for Doctor Who. The Doctor Who dress is made from 95% cotton and 5% spandex and is available in sizes Small – 3X-Large. The nice blue dress has a print on the front that makes it look just like the Tardis and that makes it perfect for everyday where or for a costume party. Become the Tardis by just wearing this Doctor Who Tardis Dress. This sticker looks a lot like the NASA logo but instead of NASA it says TARDIS and it even has the Tardis flying around. 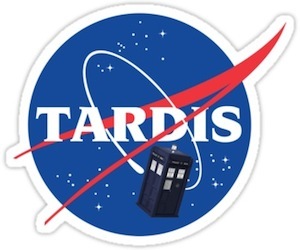 If you are the Doctor Who fan that is in need of a nice sticker then you need this Tardis sticker. The sticker can be used on almost any flat surface and it is dye cut so it looks great on for instance your laptop, locker, journal, window or even your car. The Tardis sticker is made from waterproof vinyl and that means that you can use it outdoors to. 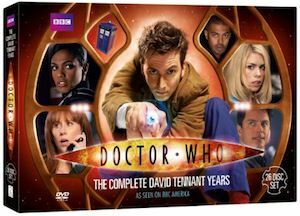 And the sticker is easy to remove so if you ever would get sick of the Doctor then you can always get it off. We don’t want to get cold while watching episodes of the Doctor and that means a nice hoodie would keep you warm. Now there is this hoodie with the Doctor Who logo on it. The hoodie is black and has the famous DW logo that looks a bit like the Tardis on it and it even has the words “Doctor Who” on it to. This Doctor Who hoodie will make people look at you and then they are gone ask you where you can buy one. And lucky for all those people this Doctor Who logo hoodie is available in a wide selection of sizes from Medium to 3X-Large. So get warm and ready for the Doctor in this Doctor Who Logo Hoodie.